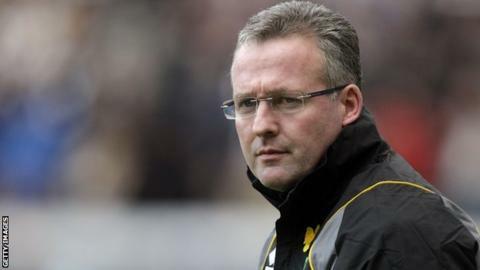 Aston Villa have confirmed that Norwich boss Paul Lambert is their new manager. The 42-year-old succeeds his fellow Scot Alex McLeish, who was sacked the day after the final game of the season. Lambert, who becomes Villa's fourth boss in less than two years, guided the Canaries to back-to-back promotions from League One before finishing 12th in last season's Premier League. "Lambert is clearly one of the brightest young managers in the country and his work at Norwich was hugely impressive. Now his task is to revive a Villa squad that has gone backwards since the departure of Martin O'Neill two years ago." A Villa statement said: "The board are delighted to confirm that Paul Lambert has been appointed manager." The former Livingston, Wycombe and Colchester boss, who recently described speculation he could leave Carrow Road as "absolute nonsense", offered his resignation to Norwich on Friday but saw that rejected. In a statement released on Saturday, Norwich said they were in discussions with Villa about compensation for Lambert and denied reports that a figure had been agreed. "We will continue to discuss this matter privately with Aston Villa," it read. "The next Norwich City manager will have a great squad of players, a robust and competitive budget and excellent facilities to work with - as well as the superb backing home and away of our fantastic supporters." Chief executive David McNally had previously told the BBC that he was ready for a fight to keep Lambert at the club. Norwich striker Grant Holt, whose future at Carrow Road is up in the air, took to Twitter upon Lambert's departure. He wrote: "Good luck to the gaffer [he] will be sadly missed at Norwich. Enjoyed every minute of his 3 years." Lambert, who enjoyed spells at Celtic and Borussia Dortmund in his playing days, moved to Carrow Road in August 2009 when the Canaries were in the third tier. He will now have the task of reviving Villa's fortunes after a disappointing campaign for the West Midlands club which saw them finish only two points above the relegation zone. Villa goalkeeper Shay Given, who is preparing for Euro 2012 with the Republic of Ireland, has welcomed the appointment. He said on Twitter: "Great appointment today for the club with Paul Lambert coming in as our new manager. I wish him well at ‪#avfc‬"
Lambert is expected to be given money to spend after McLeish spent last season reducing what he described as an "astronomical" wage bill. It is expected that he will be able to reinvest any money he generates from the sale of current Villa players. McLeish departed Villa on 14 May after only 11 months in charge. Owner Randy Lerner also held talks with former Manchester United striker Ole Gunnar Solskjaer but he opted to stay at Molde in Norway for family reasons. Villa also spoke with advisors of Wigan boss Roberto Martinez, somebody who had rejected the chance to replace Gerard Houllier 12 months ago.